We are used to hotels being nice, large buildings with stately portal entrances and parking lots on the side and manicured grounds around them. Not so in Guatemala. 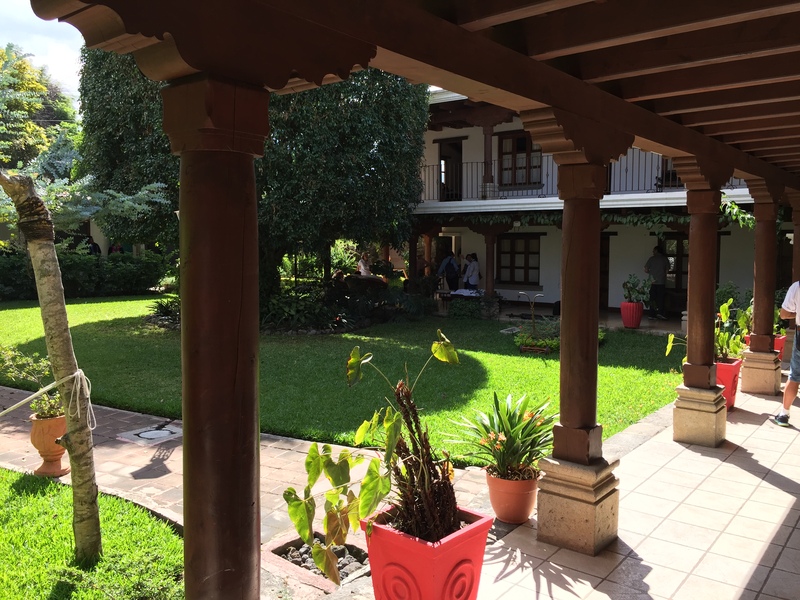 We visited the very best hotel in Antigua, the Hotel Casa Santo Domingo , several times. Rooms run from US $300 to US $600 a night. From the outside, you cannot see the hotel. It’s just a high wall in the middle the city, on a shabby cobblestone street. This is the entrance. I am the one of the right side, calling an Uber. 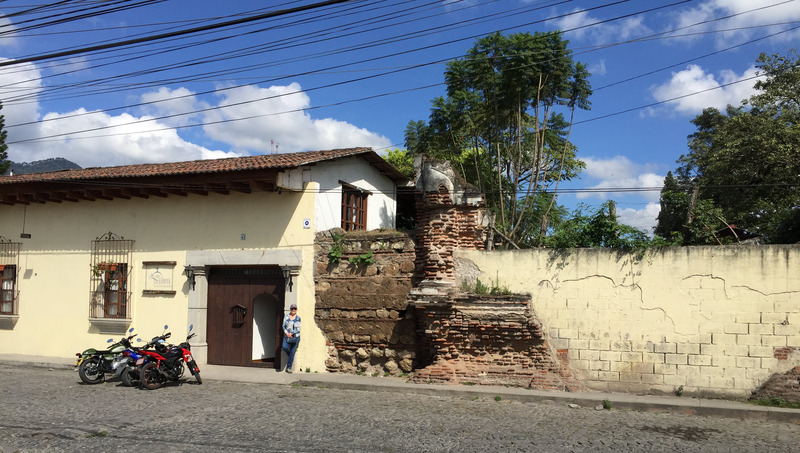 You see the sidewalk we’re on is about two feet wide and the wall is about 12 feet high and surrounds an entire city block in Antigua. The street in front of it is narrow and cobblestone covered. When you walk through this door, you enter a different world. But first, there are armed guards. We never had any trouble getting past the guards, since we’re obviously foreign tourists and they know we’re coming to spend on a single dinner as much as their own average monthly salary. But my point is – hotels are invisible from the outside, and they are guarded fortresses. We stayed at two different hotels in Antigua. The first was Hotel La Ermita de Santa Lucia. This is what it looks like from the main entrance at the street. Note the barred windows, the wall to the right, and the door. This door is locked all the time. To get in, you have to knock. Somebody comes to the door, after they inspect you through the lookout window. Once inside, it’s a friendly courtyard with the rooms all around. The inside of this hotel makes you believe you are in a completely different world than what you see from the street. This seems to be the case in all of Guatemala. This is another hotel where we stayed for a few days, el Hotel Casa San Bartolo. Yes, this is it. The door in the center is solid steel. You have to knock to be allowed in. The sidewalk is narrow. Here is the view from our room. Note the barbed wire at the top of the wall. Rich people (tourists) imprison themselves to enjoy life.